The Gowanus Lounge: "A Run on Earplugs" at Smith & Union? "A Run on Earplugs" at Smith & Union? It seems the Jim Mamary entourage has liquor on the brain. Not only will residents of Carroll Gardens near Union and Smith have to deal with noise and filthy trash from Smith & Union Cafe and The Gowanus Yacht Club, there will be something new to groan about. 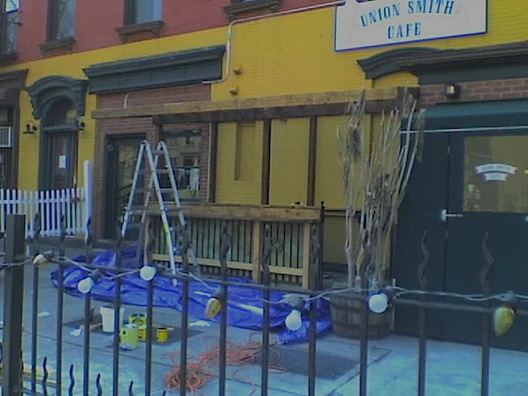 Smith and Union Cafe is building an outdoor bar to compliment their al fresco diners. I see a run on earplugs... Mamary's partner owns the cafe and Mamary is the behind the hated Hoyt Street Oyster Bar plan. A sure sign that good weather is right around the corner. Not if you live 3 doors away..this place is dirty and noisy, too be sure. I know everyone just loves the al fresco dining and drinking...but it is about time laws enforced or more restrictions placed on hours of operation , extent of operation. This goes for all the restuarants/bars with backyard usage also--- which often is worse than the street side because backyard noise seems to echo/amplify from enclosed areas. The outdoor area also sits on con ed equipment or MTA junk. note the grids and baracades around it when the tables are out. I also must complain about the fake jazz that wafts through the air in the summer months..and the smelly oil that runs onto the sidewalk and into the bus stop...and the fish heads..and the general yuck. I will never eat there..and calls to 311 do nada. waah waaah waaah, restaurants, whing whing whing, noise ... FFS move to the damn suburbs! I don't understand why they're not going up to 4th Avenue to take advantage of the density of the new condo buyers who will be clamoring for bars and restaurants with fake themes. I mean, there's nothing on 4th, and Smith is becoming over-saturated. Why don't they leave the quiet blocks alone and go to noisy 4th Ave? what does ffs mean? I like a good restaurant and bar but NOT UNDER MY WINDOW, ASSH---I'm sure I slipped in your green vomit, last night. There's no foot traffic on 4th ave. not exactly a promenade, now is it?